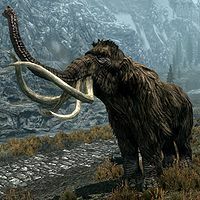 Mammoths are hulking creatures mainly found roaming the tundra of Skyrim, where their bones frequently decorate the landscape. They are enormous beasts, with shaggy coats of fur and long tusks. They are generally found near giant camps, or traveling under the protection of giants in the wilderness. Wild mammoths and tame mammoths can be distinguished by their tusks; those of tame mammoths bear engravings. If a tame mammoth is attacked, its herding giant will rush to defend his stock, provided that the attack occurs within his detection range. Conversely, if a giant that owns a mammoth is attacked, his herd will turn hostile (but only until the giant is killed, at which point the mammoth will turn passive again). Mammoths will not enter water or cross a stream in pursuit, and may get stuck behind trees or rocks, which can prove useful for those wishing to evade them or kill them from a distance. Enchanters will find mammoths especially useful, as they are the most ready and reliable source of grand souls in the game. Mammoths will slowly regain a small amount of health (about 30 points) when their health bar nears zero. If you are using a weak weapon, say a long bow and iron arrows, and have minimal skill in Archery, it can present a target that never dies. Mammoths can be hard to kill for lower level characters, since their initial level is much higher than yours at the start of the game. Mammoths have 33% resistance against frost attacks, and are immune to paralysis, Ice Form, and Vampiric Grip. Regardless of shouts used, perks, or level, you can only stagger a mammoth. It is impossible to actually make a mammoth ragdoll. Mammoths cannot be reanimated by any Reanimate spells but can be reanimated by the Ritual Stone power and the Soul Tear shout. Mammoths seem to pursue targets significantly farther than other foes, which can be helpful for you in combat. Mammoths should be engaged with extreme caution unless you are at a high level, as they hit quite hard. Even then, it is best not to engage more than one at a time. Leading a pursuing predator (bear, wolf, dragon, etc.) near a mammoth or tending giant will cause them to attack and possibly kill the predator. This page was last modified on 25 November 2016, at 16:43.